Hey, Jeff Bezos: Welcome to the Amazone! For several months now, online giant Amazon has been leaning on publishing pygmy Hachette in order to exact more, well, tribute for its bookselling. 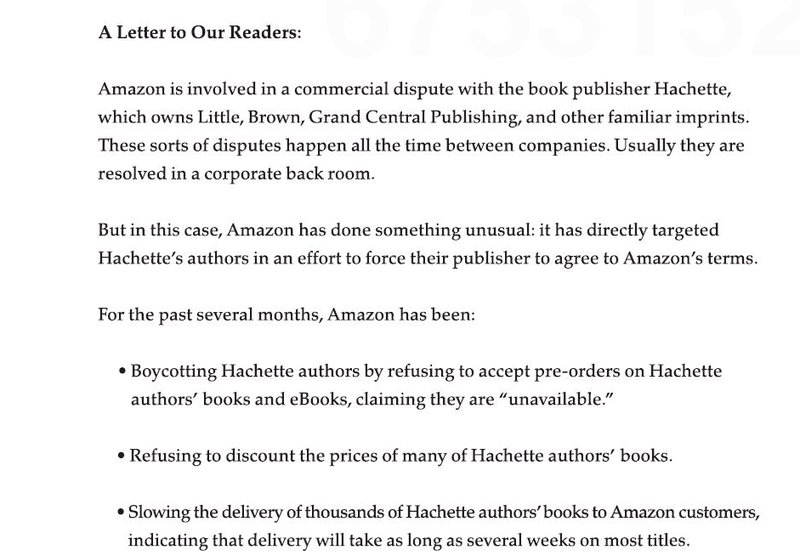 Improbably, Hachette has fought back, taking a hatchet to the Beast of Bezos. 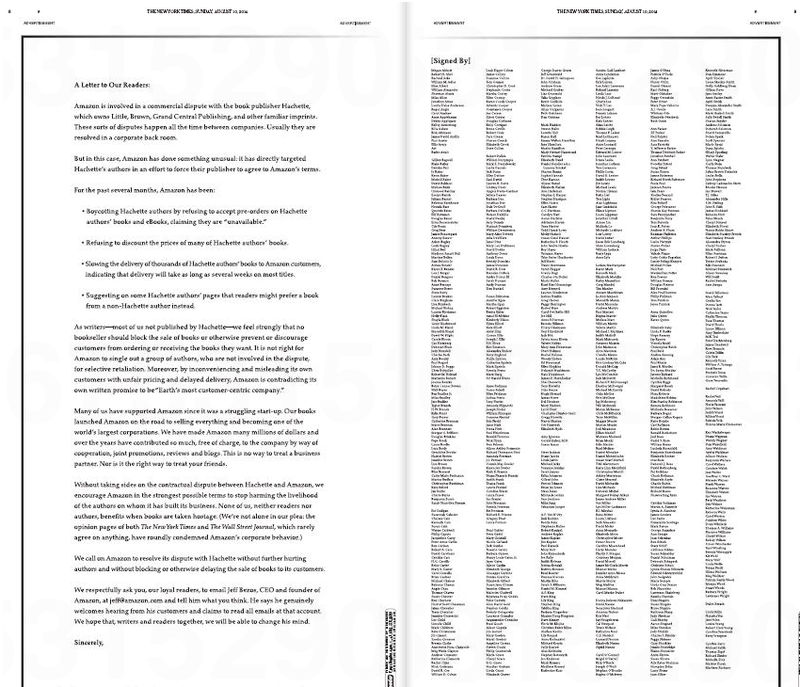 More than 900 authors including heavyweights Stephen King and John Grisham lent their names to a Sunday New York Times ad decrying AmazonCEO Jeff Bezos for pressure tactics hurting writers published by Hachette.The Paris-based owner of Little, Brown, Grand Central, Hyperion and other publishers is locked in a very public pricing battle with the online retailer.While Amazon has repeatedly said it tries to bring consumers the lowest price, the writers pointed to thuggish tactics to delay shipping and convince its customers to read authors not published by those imprints. For your convenience, the ad also includes Jeff Bezos’ email address: jeff@amazon.com. 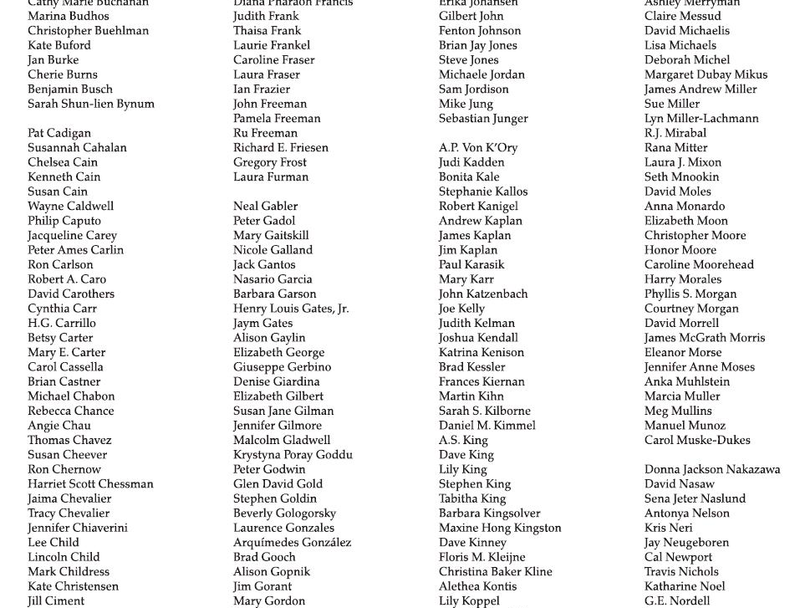 This entry was posted in Uncategorized and tagged Amazon, Amazone, Beast of Bezos, Deadline Hollywood, Hachette, Henry Louis Gates, Jeff Bezos, John Grisham, New York Times, Robert Caro, Ron Chernow, Sebastian Junger, Stephen King, Susan Cheever. Bookmark the permalink. 2 Responses to Hey, Jeff Bezos: Welcome to the Amazone! I thought I had one in there.